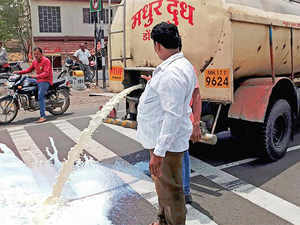 Farmers from Ahmednagar spill milk down a road during a nationwide protest, in Pune on Friday. MANDSAUR/CHANDIGARH: Protesting farmers dumped vegetables, milk and other farm produce on roads and blocked supplies to cities in several states today as they launched a 10-day agitation to press their demands, including loan waiver and right price for crops. Farmer organisations also called for boycott of mandis or wholesale markets in Punjab, Haryana, Rajasthan, Uttar Pradesh, Madhya Pradesh and Mahrashtra, leading to fears of shortage and price rise. There was little impact of the agitation in other states but the Rashtriya Kisan Mazdoor Mahasangh (RKMM) conv enor Shivkumar Sharma claimed in Bhopal that the "Gaon Band' stir is being observed across 22 states. Police kept a close vigil in Mandsaur in Madhya Pradesh, where six farmers were killed in police firing during the farmers' agitation on June 6 last year. "The cultivators have been asked not to come to the markets in urban areas to sell their farm produce, including milk," Sharma added. On the last day of the protest on June 10, the farmers' bodies will orgainse 'Bharat Bandh', he said. Markets were also shut in adjoining Neemuch district. The Mandsaur SP said no untoward incident was reported in the district. "Five companies of the Special Armed Force (SAF) of MP police are keeping a vigil across the district," he said. The decision to stop supplies starting from June 1 till June 10 was taken by farmers under the banner of Kisan Ekta Manch and Rashtriya Kisan Maha Sangh, which claim to be representing 1 72 farmer outfits. Balbir Singh Rajewal, president, Bhartiya Kisan Union (BKU), claimed good response from farmers in Punjab and other states. "Farmers have stopped bringing vegetables, milk and other items to the cities for sale," he claimed. In his unique way, Punjab Minister Navjot Sidhu supported the farmers' protests by visiting village Patto where the cricketer-turned-politician bought milk and vegetables from farmers "to highlight their significant contribution in the development of the nation". "If the country is to be saved, then saving farm sector ought to be a priority," Sidhu, who was accompanied by Congress MLAs Kuljit Singh Nagra and Gurpreet Singh, said. If the ruling NDA government at the Centre had fulfilled their pre-poll promises, the farmers would not have been in such a sorry state of affairs, the Congress leader said. Rajewal claimed that not only in Punjab and Haryana, farmers in Uttar Pradesh, R ajasthan, Madhya Pradesh and some other states were also not selling their produce in cities. At some places in Punjab, farmers dumped vegetables and milk on road as a mark of protest. In Rajasthan, supply of milk, vegetables and other farm produce was hit in Sriganganagar, Hanumangarh and Jhunjhunu districts, Santveer Singh, a member of the core committee of the Rashtriya Kisan Mahasangh in the state, said. He said protests were held in Bikaner, Sikar and Nagaur districts as well. The farmer organisations have alleged that the central government has failed to address their issues pertaining to low income, farmer suicides and debt. "We have also been demanding minimum income guarantee scheme, implementation of Swaminathan Commission report and waiver of farmers' debt," said Rajewal. In Maharshtra, farmers took out a protest march in Akole tehsil in Ahmednagar district. Urgent: Need funds to pay for my son's expensive transplant.